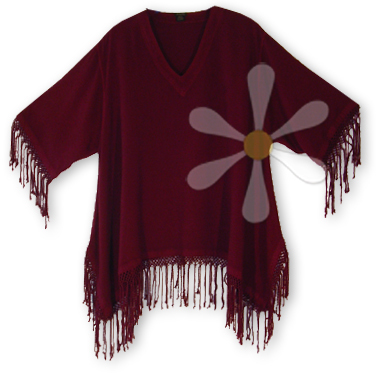 This yummy V-neck tunic is all sorts of gypsy wild! The sides widen out towards the hemline thanks to 9" comfort slits, where gorgeous hand-knotted fringe falls luxuriously all the way round... on the sleeve hems, too! Can you spell f-a-b-u-l-o-u-s? You can cinch it at the waist with a wide Moroccan belt or contrasting sash or scarf, or let it fall dreamily over your favorite pants or skirt... either way, it is a style you can wear any time, any way! For a longer, more generous version, see our FASSI-PLUS tunic.